The Pulse of Portland Music Project (POPMP) is a project designed by Judy A. Rose, Music teacher and Judy Arielle Fiestal (KBOO). 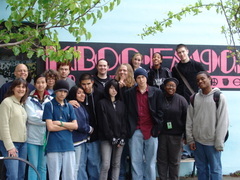 In collaboration with the KBOO Youth Collective, students create audio pieces at school that are aired on KBOO Community Radio. Students have produced original songs, vox pops, personal essays, commentaries, and audio profiles of the musicians who have visited them in their classroom. The vision of POPMP is for students to connect with the local music community while having a voice in the larger community. I put this together, Doing it the way I wanted to do and based on the way I felt. It's just piano and birds. This one is based on a techno feeling. i liked this piece because of the feeling. Didn't know what to add so its just piano. this is a story made up of different musical instruments. Time warp feel, weird day when i made this.